This week I have officially started recording and interviewing people for the second season of my podcast! I’m elated but overwhelmed. I feel like there is always too much to do and that I don’t have enough hands or hours to accomplish everything I want to get done. I feel like I’m shoveling a super healthy salad down my throat, meaning I’m doing a lot of fulfilling and productive creative work but going through it all too quickly. I’m not taking the time to sit and savor it. This reminds of another time in my life when I was overwhelmed with all of the creative opportunities I had. When I was 19, I had just finished my first year of college, and although I had declared a major, I still felt undecided about my future. I have always been a person who wants to do everything at the same time.I wanted to learn how to write and dance; I wanted to learn psychology and how to knit; I wanted to be on stage and travel the world. I wanted to do so much I never got anything done. One day during summer break, I went to Great Barrington, Massachusetts, near my hometown, for the afternoon and stumbled upon a yoga+meditation bookstore. It was filled with books about mindfulness, Buddhism, and Tibetan decorations. The store had a stillness about it that felt like it was in a deep rem cycle. It was a calmness I was unfamiliar with. I perused the store at a pace that was slightly slower than I was used to and selected 5 books off the shelf, unsure of which one to get. I go up to the counter where there is an older woman wrapped in soft, bright scarves and beaded bracelets jiggling against one another as she begins to handle my compulsive book selection. “You’re going to read all of these?” she asks. She selects the book she thinks I need the most, rings me up and sends me on my way. I go back to that advice all the time when I feel like I am biting off more than I can chew. Just focus on one thing until it’s complete. Have the judgment to know if it isn’t serving you, but don’t go running around the mountaintop because you won’t be able to enjoy the view from where you stand. Let's gear up and enjoy the process of making the second season of my podcast! 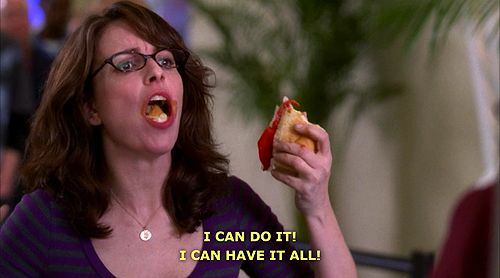 I really am trying to avoid becoming Liz Lemon, I promise.